Drones produce high quality, low cost data. We’ll help you make the most of this technology by collecting, processing and/or interpreting it so you can get the most out of every dollar and each hour you spend on your projects. If you’re a small organization and are not sure what to do with GIS data we can help. Contact us at nathan@smartshores.ca for a free consultation. Orthomosiacs are often used to monitor ecosystem changes and plan restoration work. They permit measuring distance and area at up to sub-centimetre resolution with high visual fidelity on an interactive map.They are available for use in Google Earth and in GIS applications like ArcGIS and QGIS. 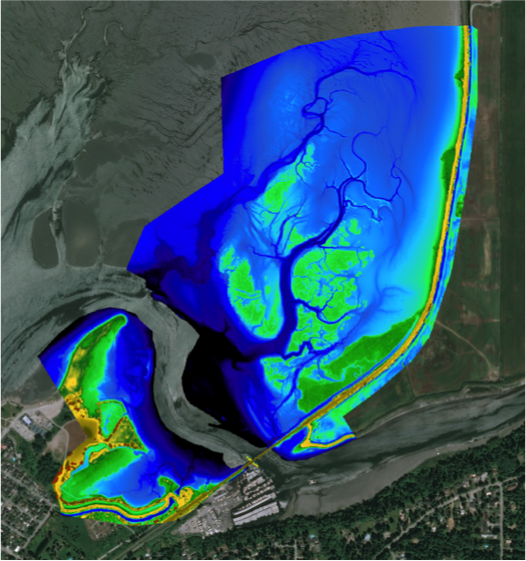 Digital Elevation Models (DEMs) can be used for calculating cut/fill volumes for environmental restoration projects, monitoring erosion/accretion, and planning for sea level rise. DEMs allow you to measure surface topography at up to 5cm precision and resolution. Point clouds are used for advanced GIS analysis and can be turned into a 3D mesh for use in engineering workflows in software like CAD. Points within a scene can be classified into different categories (e.g. sand, mud, vegetation, road) and used to produce custom outputs. Ultra-high density point clouds can also be used for specialized ecological assessments such as monitoring the growth of trees in a restored area (i.e. tree height, width and volume of stems/trunks). Prices vary based on the size of a site and whether or not the level of precision needed requires a ground survey. General guidelines are provided below. Send an email to nathan@smartshores.ca for a free quote. Please include the size of the site and an address or GPS coordinates - or if you are able - a shapefile or shared Google Map polygon. Visual media services are discounted when combined with mapping on the same site visit. The low end of the price range for drones as a service is for when no ground survey is required. The low end of the price range for drone data processing is for when there is no ground survey data and coordinates are taken from the drone’s onboard GPS unit via geotagged images. There is also a 50% discount on drone data processing fees for set-up and computing time and a 33% discount on manual data processing with a subscription (pre-payment of at least three maps within one calendar year).